Matthew 26:17-19 17 On the first day of the Festival of Unleavened Bread, the disciples came to Jesus and asked, “Where do you want us to make preparations for you to eat the Passover?” 18 He replied, “Go into the city to a certain man and tell him, ‘The Teacher says: My appointed time is near. I am going to celebrate the Passover with my disciples at your house.’” 19 So the disciples did as Jesus had directed them and prepared the Passover. John 13:2-17 2 The evening meal was in progress, and the devil had already prompted Judas, the son of Simon Iscariot, to betray Jesus. 3 Jesus knew that the Father had put all things under his power, and that he had come from God and was returning to God; 4 so he got up from the meal, took off his outer clothing, and wrapped a towel around his waist. 5 After that, he poured water into a basin and began to wash his disciples’ feet, drying them with the towel that was wrapped around him. 6 He came to Simon Peter, who said to him, “Lord, are you going to wash my feet?” 7 Jesus replied, “You do not realize now what I am doing, but later you will understand.” 8 “No,” said Peter, “you shall never wash my feet.” Jesus answered, “Unless I wash you, you have no part with me.” 9 “Then, Lord,” Simon Peter replied, “not just my feet but my hands and my head as well!” 10 Jesus answered, “Those who have had a bath need only to wash their feet; their whole body is clean. And you are clean, though not every one of you.” 11 For he knew who was going to betray him, and that was why he said not every one was clean. Matthew 26:26-30 26 While they were eating, Jesus took bread, and when he had given thanks, he broke it and gave it to his disciples, saying, “Take and eat; this is my body.” 27 Then he took a cup, and when he had given thanks, he gave it to them, saying, “Drink from it, all of you. 28 This is my blood of the covenant, which is poured out for many for the forgiveness of sins. 29 I tell you, I will not drink from this fruit of the vine from now on until that day when I drink it new with you in my Father’s kingdom.” 30 When they had sung a hymn, they went out to the Mount of Olives. 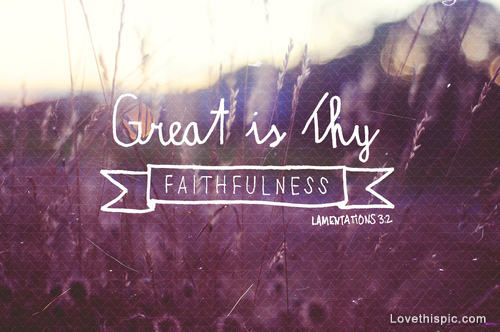 Great is Thy faithfulness, O God, my Father. Thou changest not, Thy compassions – they fail not. All I have needed Thy hands hath provided. I have great respect for Dr. Kuban and the M.D. Anderson team that treated me, but I give credit and praise to Jesus, my Savior and Healer. Allow me to share the words on the sign in front of Tenwek Missionary Hospital in the highlands of Kenya, Africa: “We Treat – Jesus Heals.” I also acknowledge the hundreds, perhaps thousands, who pleaded my case before God’s Throne. Your prayers sustained me, encouraged me, and carried me to healing.